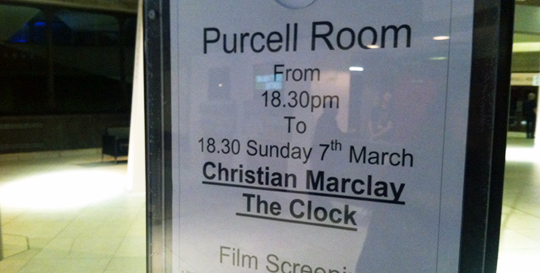 I went down to London’s glamourous Southbank Centre yesterday for a one-off screening of Christian Marclay’s mind-blowing 24-hour art film The Clock. Constructed from thousands of carefully selected clips, Marclay’s film acts as a cinematic timepiece – illustrating every minute of its epic runtime with a film scene that takes place at that exact time. So at 6am, Bill Murray wakes up in Groundhog Day. At 10:04pm, lightning strikes the clock tower in Back to the Future. And so on. I watched about an hour last night and can confirm that it’s absolutely excellent: a fascinating, hypnotic history of cinema condensed down to a single timeline. It continues at the Southbank Centre until 6:30pm today and admission is free so get down there if you can.